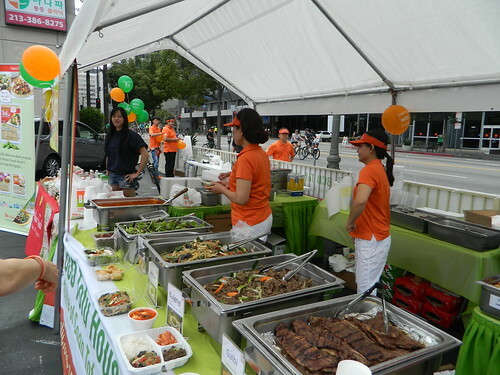 At the Koreatown hub of CicLAvia, several Korean restaurants gathered at Serrano Avenue for the Koreatown Barbecue Festival. CicLAvia’s fifth Los Angeles mass ride/walk on Sunday, June 23, 2013, was Iconic Wilshire Boulevard, which took cyclists, skaters and pedestrians from Downtown Los Angeles to Fairfax Avenue. This spans Downtown Los Angeles’ Financial District and City West neighborhoods, Westlake, Koreatown, Wilshire Center, Windsor Square, Mid-Wilshire, Miracle Mile and Hancock Park. 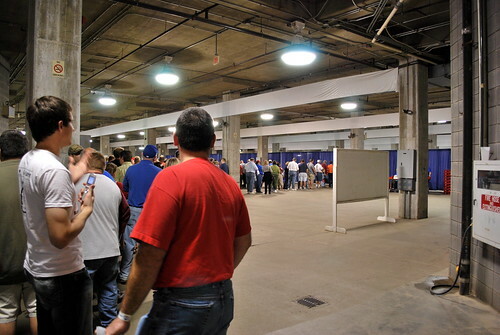 Kansas City Barbeque Society–certified judges line up to get their judging assignments for the invitational turn-ins. Judging was done behind the blue curtains. The interesting thing about seeing the throng of judges is that they’re just ordinary folks who became KCBS-certified for barbecue judging. There were folks of all stripes in the line.